In 2019, join The Devil Strip to LIFT Akron! For generations, parents have said that video games will rot the brain. But at the University of Akron and dozens of other universities nationwide, video games could win students a scholarship. In December 2017, the university announced plans to create an esports program that would “mirror traditional varsity athletics.” In the following months, the university built out its teams and coaching staffs and began constructing an arena and other facilities. Players try out for teams, adhere to practice schedules, and are subject to academic oversight, the university says. 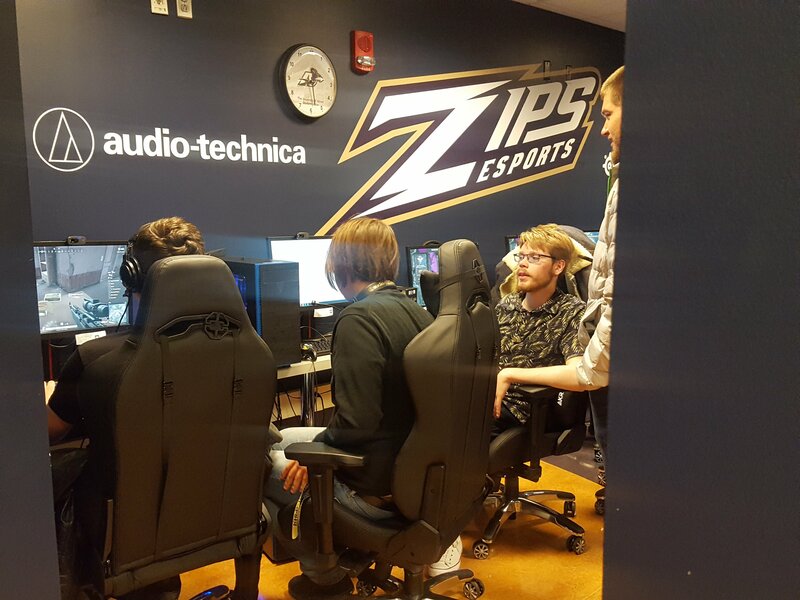 UA is not the only U.S. university building facilities for esports teams. Western Michigan University unveiled its own esports arena on Oct. 5, 2018, the same day UA did. Ohio State University recently announced plans to build one too. UA’s program has varsity teams in the games Rocket League, Overwatch, Counter Strike: Global Offensive, Hearthstone and League of Legends. There are also club teams, which play a wider range of games, and a recreational program for players not looking to play competitively. The university is also offering scholarships of up to $5,000 for varsity players. 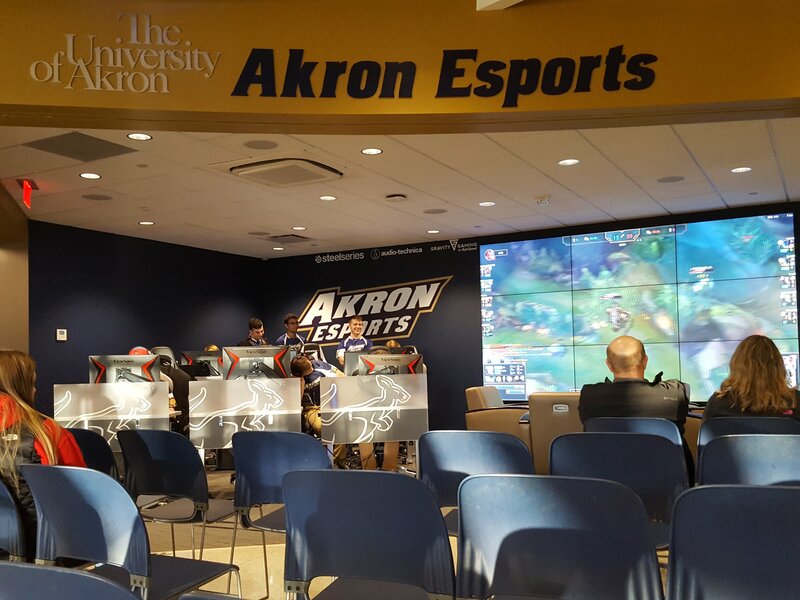 The University of Akron’s administration took the lead in creating the program — a move that even Michael Fay, Jr., UA’s esports program director, found surprising. Former UA President Matthew Wilson pushed the initiative, and Fay was hired to direct the program in January. Fay had coached amateur Canadian teams in League of Legends and has followed esports since he was a teen. He says he was surprised by the university’s initiative to create its own program. Wilson explained that, while he was president, he was on the lookout for ways to distinguish the university. He discovered esports at a university level and thought it seemed like an exciting prospect. Wilson believes that the program could be applied to a variety of academic programs. But not everyone was so enthusiastic about esports. The new facilities cost UA roughly $750,000. The university announced in June that it is operating on a $16 million deficit this fiscal year. And in August, UA announced that it would be cutting 80 “underperforming” programs, about 20 percent of the degrees currently offered serving about 5 percent of the student body. In August, members of the American Association of University Professors based in Ohio sent a letter to the University of Akron’s administration, criticizing what they felt to be a lack of care for education. “It is as though you are saying: Well, we are bored with education so let’s play games instead,” wrote John T. McNay, a professor at University of Cincinnati. In addition, the local AAUP feels the resources allocated to the esports program in comparison to academic programs is neglectful on the administration’s part. “There are programs that are really struggling, and we’re being told to just deal with it. We’re not really putting enough into academics,” says Pamela Schulze, president of the Akron-AAUP’s executive committee and a professor in UA’s Child & Family Development department. Schulze says she has no problem with an esports program as a concept, but feels that the investment in a new athletics program detracts from academics at the university. “I think that people who are spending money on education have a right to expect their money is actually going to education,” Schulze says. However, it’s not like there aren’t any students interested. 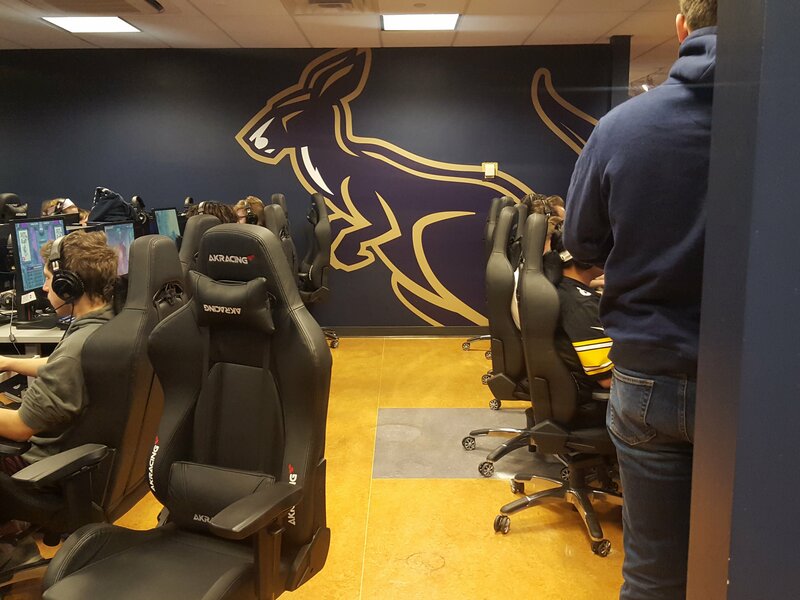 During the spring 2018 semester, Fay recalls that roughly 1,100 students tried out for the chance to play video games competitively at a varsity level. Gage Pamer, a freshman at UA, decided to attend the university after trying out and getting a spot on the Blue varsity team for Counter-Strike: Global Offensive. Pamer is interested in esports photography and filmography and hopes to continue to be a part of the esports community after graduation. Cole Jones, a junior cybersecurity major and member of the Gold team for Counter-Strike: Global Offensive was also drawn to the university by the esports program. Jones says he transferred to the University of Akron to participate in esports. According to Fay, students have begun to attend matches as spectators, cheering on the competing teams. Fay believes the validation of support from the university, fans and independent companies has helped boost his team’s confidence. In a match against an OSU team, Jones says the program’s arena was filled up by fans. The teams also have “partnerships” with companies. Audio Technica supplied the team’s headsets, Gravity Gaming donated gaming PCs and consoles and Steelseries gave the team keyboards, mouse pads and mice. Audio-Technica is contributing money for two $2,500 scholarships for one varsity esports player and one audio-engineering student per year. According to the university’s Office of Financial Aid, the audio engineering scholarship will be rewarded to students involved in the esports program as well. Schulze notes that while she isn’t aware of every aspect of the program, it is unclear to her how the program plans to make money. So far, UA’s esports teams have done well in their inaugural seasons. The Gold Rocket League team took third place in a Collegiate Rocket League Tournament this fall. Many teams have won most of their matches in their first semester of play. 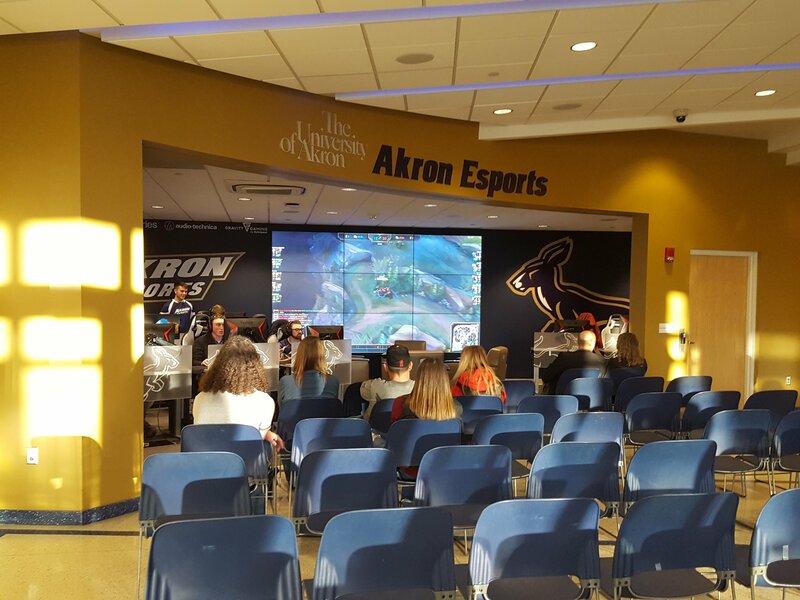 Esports has created a new path for students to consider at the University of Akron. What happens at the next level remains to be seen.